The Tuckahoe Equestrian Center is a fast-growing, family and youth-oriented equine facility located on the Eastern Shore of Maryland in Tuckahoe State Park, near the town of Ridgely. We are a not-for-profit, 501 (c)(3) organization, actively promoting all equestrian activities such as 4-H, trail riding, driving, jousting, parades and horse shows which include jumping, dressage and English or Western equitation. With merely a vision and the hard work of many volunteers, Tuckahoe Equestrian Center was born. From humble beginnings, T.E.C. has made great strives in creating a premier equine facility for the Delmarva Region. We are proud of our 20+ miles of woodland riding trails, 300×150 foot show arena with a permanent raised announcer’s stand, permanently installed audio system which covers the entire grounds of the center, lighted jousting path, barn with stalls, picnic area, clubhouse and Tuckahoe City (which is featured in our annual fund-raiser – Tuckahoe Outlaw Days). While these accomplishments are great, T.E.C. volunteers are never idle. There are many new and exciting projects in the works. To fully appreciate our humble start, take a look at the pictorial, which takes you from when the site was known as the Crouse farm all the way through to Winter 2002. Of course, none of this would have been possible without the tireless efforts of our wonderful members and volunteers. For this and all the many hours of sweat and tears that has gone into making T.E.C. the best darn horse place around, we gratefully extend the heartiest of thanks!! If you would like to join us – membership in The Tuckahoe Equestrian Center brings a variety of benefits. Members receive a monthly newsletter and have access to an active and knowledgeable group of horsemen who meet on the 3rd Wednesday of every month at 7pm at the clubhouse. Members have horse-camping privileges on the T.E.C. grounds – a benefit not available to the general public. There are frequent opportunities to participate in T.E.C. 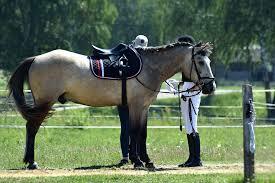 – sponsored trail rides and a wide variety of other equestrian activities. Participation in mounted activities does require a signed liability release form.